I am trying to toggle a small relay on and off. I have connected a GPIO pin and GND directly to the relay. I can hear the relay clicking, when I set the GPIO pin to HIGH. However, the relay only rarely lets a signal through. It works some times, but rarely. If I set the pin to HIGH, and measure the voltage, it is only around 1.6V - so I guess sometimes there is not enough power to drive the relay. I have previously measured the voltage on the pins, and it read 3.3V. Any ideas on what could be the problem? You should not directly drive a relay from the Raspberry Pi. An individual GPIO can only safely provide about 16mA at 3V3 which is unlikely to be enough to energise the coils of a standard electromagnetic relay. Even if you could the back EMF caused by the collapsing magnetic field in the relay coils when it was switched off could destroy a GPIO and the Pi. 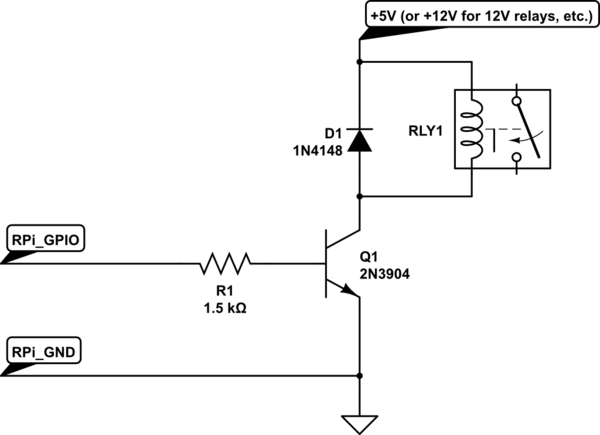 You should use the GPIO to switch an external circuit to switch the relay. Typically a transistor (to amplify the current) and a diode (to protect against back EMF) would be used. Personally I'd probably use a ULN2003A chip as they were sort of designed for this purpose. There are lots of relays built into driver boards available for the hobby market. Note: R1 can be replaced by a LED and a 200 - 500 Ohm resistor in series if you want a visual clue about the state of your relay. This is what is often done on pre-made relay boards. I have successfully used I2C expander MCP23017 with cheap relay-boards. I have not actully written any how-to's yet but there is plenty around, just look at google and search for "RPI MCP23017". Not the answer you're looking for? Browse other questions tagged gpio relay or ask your own question. Are my GPIO ports not working? Why is my GPIO not switching my attached relay?